I relocated some Coneflowers in my Toronto garden last fall, and was blessed with the gift of a few more from a friend, and the plants seem to be flourishing in their new location. 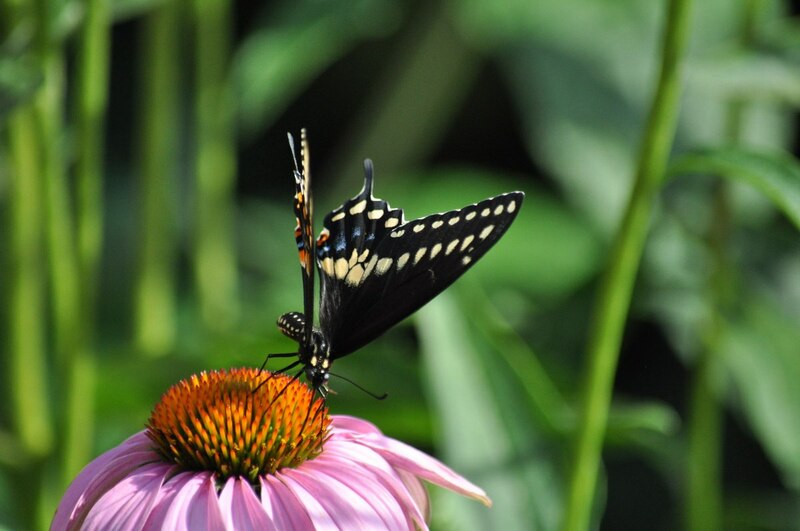 Bob and I have monitored them closely since they are said to attract butterflies, and late one afternoon, we spotted this beauty, a Black Swallowtail Butterfly tasting the nectar from one particularly tall specimen. 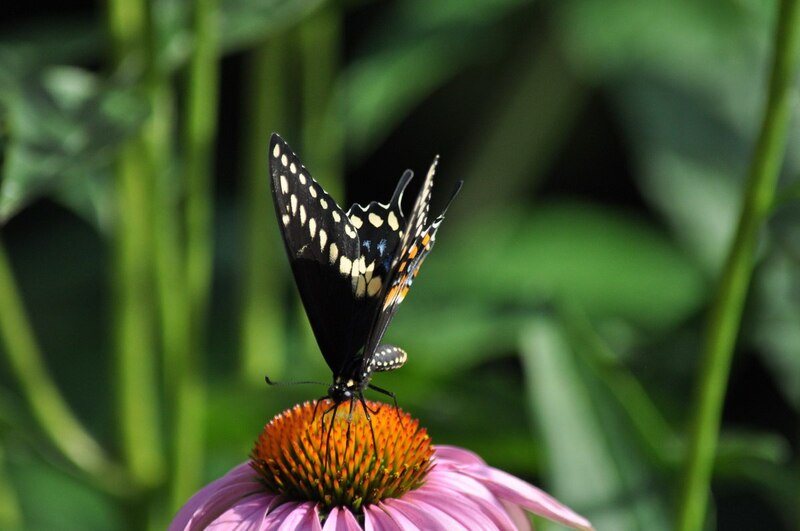 When first I spotted this Black Swallowtail butterfly, I was convinced that it was a Spicebush Swallowtail, more wishful thinking than good judgement, but the two species are very similar. Even when I began to compare this specimen’s attributes to the butterflies featured on Butterflies of Ontario, I began to think I was right. The pattern on the ventral surfaces of the two species’ wings are very similar, so I had to pay particular attention to the orange spots or lack thereof in order to make positive id. I felt a little disappointed when I realized that I could not claim to have seen another new species, but regardless, this Black Swallowtail was a healthy good-sized male that was more than welcome in my garden. As Bob and I circled the flowerbed aiming for better angles on the butterfly, it was acutely aware of our presence and kept flitting out over the neighbour’s backyard and then back to our flowers. 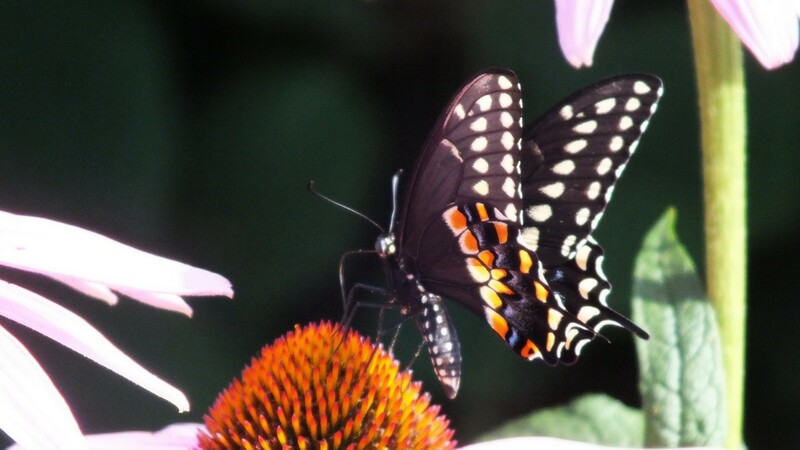 I was intrigued to learn that Black Swallowtail Butterflies also go by the name American Swallowtail, Parsley Swallowtail or Parsnip Swallowtail. When doing a little research into the source of their alternate names, I learned that the larvae feed on foliage and flowers of plants such as carrots, parsley, parsnips, dill and Queen Anne’s Lace, all members of the Carrot family of plants. Having gained this knowledge, I am anxious to check the parsley plant in my garden to see if we are lucky enough to have any eggs deposited on it. That would be so cool! In large numbers, these butterflies have occasionally been considered pests for damaging crops, but I would gladly sacrifice a parsley plant or two in order to observe their life cycle. This year, in Ontario, butterflies of every species seem to be seen less frequently than in other summers. 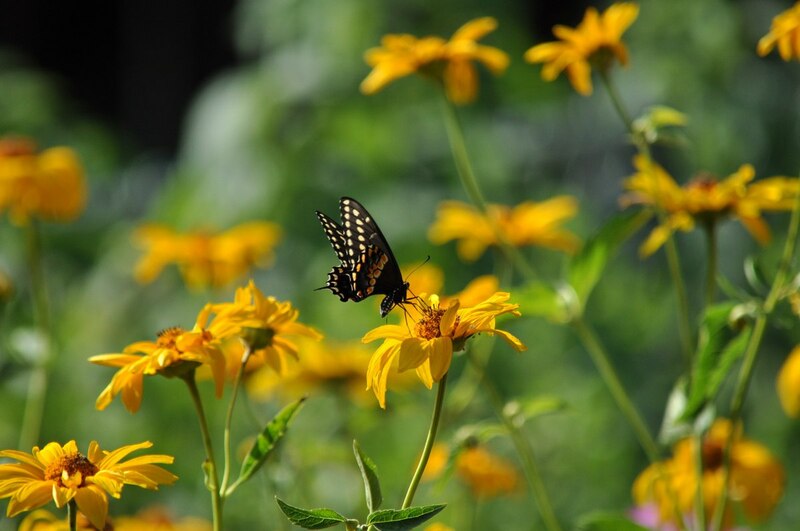 We experienced a very cold, wet spring that might account for the low numbers, but even at that, Black Swallowtail Butterflies are fairly common throughout North America. With the significantly-sized wingspan of 2.5 to 4 inches (6 to 10 cm) of these pretty butterflies, they add a dainty beauty to any garden that they visit. Bob and I observed firsthand the speed and agility of this Black Swallowtail butterfly because every time we moved in to try for a micro shot, the butterfly adroitly zipped along a few feet above the ground. 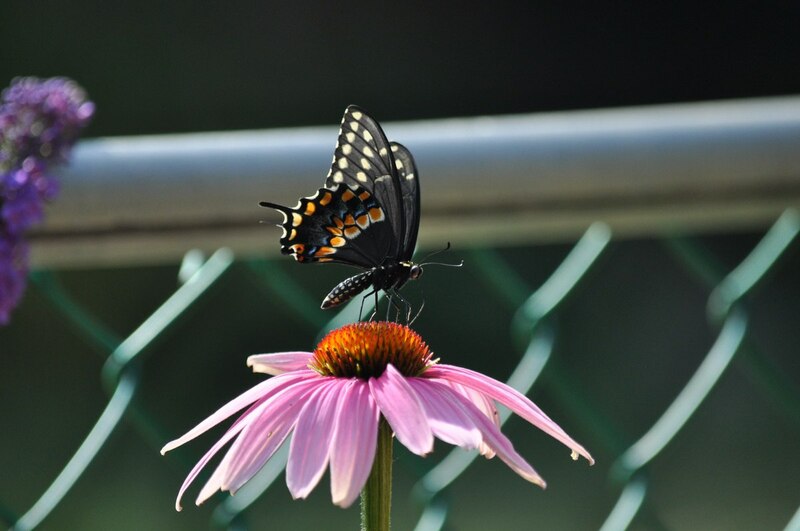 The Coneflowers must have been irresistible, situated as they are in full sunlight, because this butterfly returned over and over again to bask in the sun and sip the sweet nectar. It was like he was dancing through my garden.